Students have been taking part in a new program at the Western College of Veterinary Medicine (WCVM) that gives them the opportunity to graduate with dual Master of Business Administration (MBA) and Doctor of Veterinary Medicine (DVM) degrees. When Elad Ben-Ezra put his veterinary studies on hold last year, he didn’t stray far from his chosen career. The veterinary student has been taking part in a new program at the Western College of Veterinary Medicine (WCVM) that gives him the opportunity to graduate with dual Master of Business Administration (MBA) and Doctor of Veterinary Medicine (DVM) degrees. As part of his business degree, he’s working to develop a model for determining the cost-benefit of pregnancy checking in cattle – illustrating just one of the many ways a business background could benefit today’s veterinarian. “There’s just tremendous opportunity, applying business theory and knowledge to the veterinary world,” says Ben-Ezra. The WCVM has partnered with the University of Saskatchewan’s Edwards School of Business to build the combined program that’s designed as a way to more adequately prepare graduates for a changing employment outlook. “The range of jobs in which veterinarians are employed today has expanded significantly,” says Dr. Bruce Grahn, WCVM’s associate dean academic. Modern veterinary work is no longer limited to small practices. There are many different jobs veterinarians can take, whether it’s working for a pharmaceutical company, managing a large corporate practice or advising government. Grahn says the true success of the program will be measured in five to 10 years when its students have embarked on their career path – then it will be easy to see the impact of their diverse dual degrees. For those who don’t see themselves in traditional practice, the program offers an attractive opportunity to build diverse skills. “I’ve always had an interest in the business side of things and finance. I thought it would be an interesting extension of the program,” says DVM-MBA student Sarah Champagne. While there are similar combined degree programs in the United States, the WCVM’s program is unique to Canada. The MBA degree exposes students to a wide range of knowledge that will give them a good grounding in management. Student Alex Muzzin sees the program as invaluable to future veterinarians because it gives them everything from business and human resource knowledge to finance, accounting and leadership skills. For Ben-Ezra, the substantial scholarships offered by WCVM and Edwards School of Business helped make the program more enticing. The two colleges provide scholarships totalling approximately half of the program’s $28,000 tuition to each DVM-MBA student. The students from the WCVM join a cohort whose backgrounds span a range of professions from engineering to education. Because the MBA program is designed for students of different backgrounds, it’s well-suited to the needs of emerging veterinary professionals. “This is something that’s really important for the future of vet med, [for] the future of those students. When they go out they can make a real difference in their communities because they’ve developed skills that other vet meds [veterinarians] wouldn’t have even considered,” says Noreen Mahoney, associate dean of students and degree programs at Edwards. The Edwards MBA program is a good fit for students already accustomed to the rigour of veterinary studies. “They’re superstars,” says Courtney Schroeder, manager of the MBA and Master of Science programs at Edwards. The dual-degree veterinary students have nothing but positive accolades for the program that provides real-world experience and networking opportunities. “I would encourage them [students] to seriously look at it,” says Champagne, noting that unless a veterinarian wants to be an employee for her entire career, business skills are a must. Students generally enrol in the MBA portion of the program after completing their third year of veterinary medicine. Once the business courses wrap up, they return to veterinary school to finish their fourth-year clinical rotations and write their national accreditation exam. Ben-Ezra says he’s not worried about taking a break from veterinary medicine to focus on business. Sarah Champagne grew up in northern British Columbia and earned a science degree in biology at University of Northern British Columbia before being accepted at the WCVM. She earned her DVM degree in 2014. During the MBA portion of her degree, Champagne has focused on an inventory management project at the WCVM’s Veterinary Medical Centre. She says her veterinary knowledge has been a great help for the project. “Having that background knowledge and knowing what products link to which procedures is vital for what I’m doing,” she says. Champagne is working at the WCVM in an administrative and curriculum development role while completing her MBA program. Alex Muzzin grew up in Coquitlam, B.C. and studied in Kamloops before being accepted into the WCVM. She earned her veterinary degree in 2014 and then entered the combined MBA program. She’s working with fellow student Elad Ben-Ezra on a consulting project that measures the cost-benefit of pregnancy checking in cattle. “I really like the program. I think it has opened up so many doors for me. It has broadened my general knowledge. The people I’ve met have been fantastic and are so different [and] from so many different fields,” she says. Elad Ben-Ezra is originally from Montreal, Que. He earned an undergraduate degree in biology at the University of Ottawa as well as a master’s degree in wildlife biology from McGill University. He will graduate from the WCVM in 2016 with a combined DVM-MBA degree. He’s working with fellow student Alex Muzzin on a consulting project to determine the cost-benefit of pregnancy checking in cattle. “It’s a way to measure the economic benefit,” says Ben-Ezra. Their MBA project will allow them to put solid numbers behind the procedures and treatments they do as veterinarians, and allow them to bring “information and dollar figures” to producers. 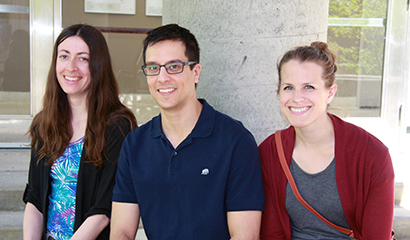 Above: The DVM-MBA students (from left) Sarah Champagne, Elad Ben-Ezra and Alex Muzzin.